It still seems strange to me. Disney owns Marvel Comics. And Disney has a long tradition of comics featuring Mickey, Donald and Uncle Scrooge. Yet instead of publishing new comics with these characters under a Marvel imprint, Disney has licensed these core characters to IDW! Uncle Scrooge #1 or legacy #405 contains three stories. 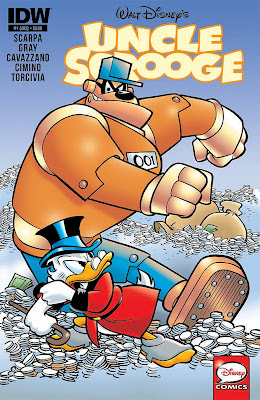 The first story, "Uncle Scrooge vs Gigabeagle King of the Robot Robbers" by Rodolfo Cinino and art by Romano Scarpa pits Uncle Scrooge against the Beagle Boys who of course wish to steal Uncle Scrooge's fortune. This time the robbers use technology, creating a giant robot beagle who uses his massive strength to make an attempt to swipe Uncle Scrooge's money bin. The entire Duck crew is called in to keep Uncle Scrooge calm and face down the villains. The second story, "Pure Viewing Satisfaction" by Alberto Savini with art by Andrea Freccero is a one page tale that features Uncle Scrooge's television viewing habits. 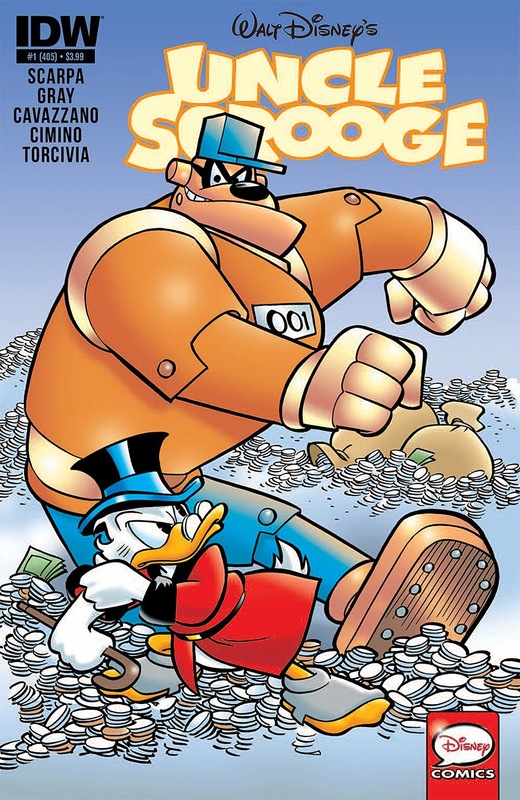 The third story, "Stinker, Tailor, Scrooge and Sly" by Scarpa and Luca Boschi with art by Scarpa demonstrates Uncle Scrooge's cheapness as a robber attempts to steal his very aged jacket. The story includes Uncle Scrooge attempting to get his coat fixed for free, since the cheap job from over decade ago is finally wearing thin. The readers discover that the thief has a very important reason for wanting the coat, a secret discovered by the Duck fashion community. I have some mixed feelings about the book. First, the book features Duck experts from the Italian Disney comics scene. So I do like the idea of them receiving exposure in the United States. But I did find the story a little slow. I personally liked the story from Walt Disney Uncle Scrooge and Donald Duck: A Matter of Some Gravity. But the Between Kid still enjoyed the story, it appeared. Though I was convinced the issue was too slow paced for a young appetite. And there was a request from issue #2 which has a cover featuring Huey, Dewey and Louie on a pirate ship. Though I will admit I have not bought it yet. I do think this is a great priced comic. $3.99 for 48 pages! This price cannot be beat for a monthly title. 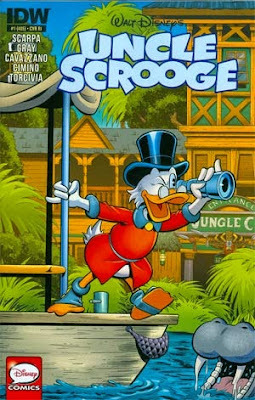 So I would say if you want to dip your toe into a comic title these Disney titles may IDW may be a good place to start. There are a variety of variant covers. I did debate buying the Adventureland Variant because of my love of the Jungle Cruise. I have not paid the higher fee yet, but I will likely continue to debate the purchase every time I go to my local comic shop. I would say that IDW has treated Uncle Scrooge fine in Uncle Scrooge #1. Experienced Duck creators are being given a greater exposure. And the price is very competitive. 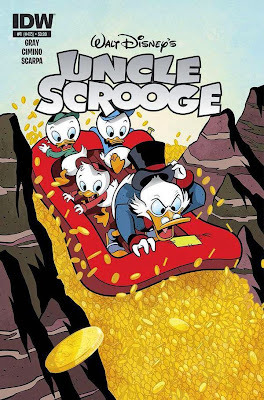 I may not grab Uncle Scrooge #2, but I will likely grab Donald Duck #1 just to see if these trends continue.